Crews had to upright the propance truck. A tanker truck filled with propane tipped over in New Britain, Pa. Monday afternoon causing nearby homes to be evacuated for hours as Hazmat crews worked to clean the scene. The crash happened around 4:20 p.m.
Three homes near New Galena and Trewigtown Roads were evacuated as of 5 p.m. as propane leaked onto the roadway, Bucks County officials said. The roads were shut down and some power lines were de-energized as crews work to contain the spill, cops said. As of 7:50 p.m., crews were still working to right the tanker as residents remained out of their homes. As of 9 p.m. the vehicle was uprighted, power restored and people were allowed back in their homes, according to authorities. 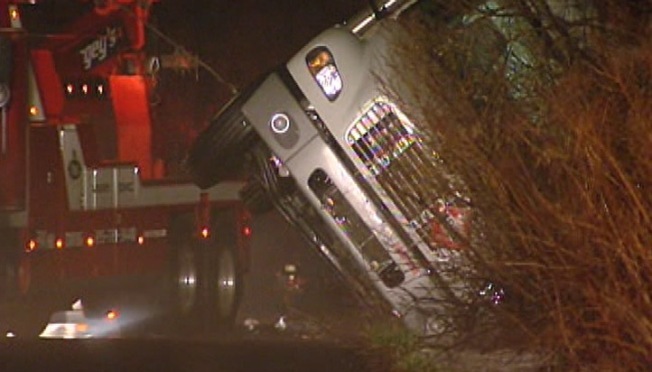 The road was reopened around 10 p.m., officials said.